Airpods, galaxy buds, outlier air all are charged in the case magnetically. u do not need to plug in the usb cable to the case to charge the outlier air buds. Just make sure the case has enough battery and just pop in the air buds and it will charge. This is the same for airpods and galaxy buds. U can still charge the outlier buds in the case while the case is being charged via usb. 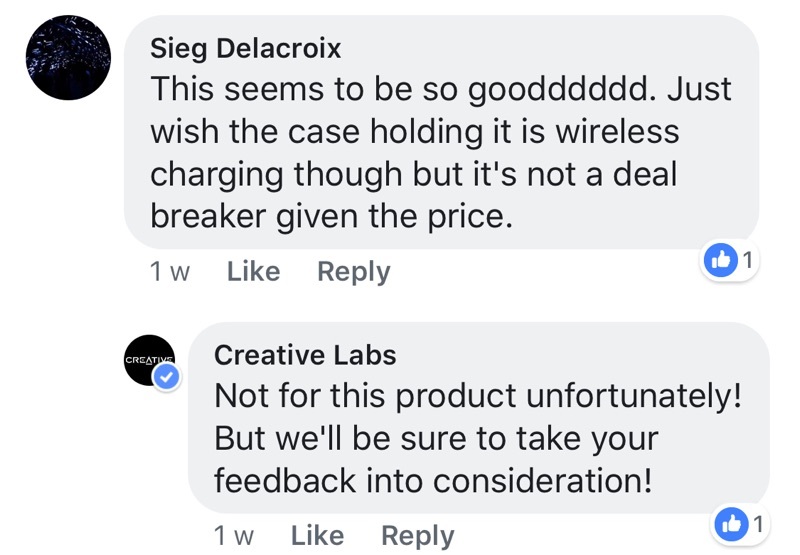 That screenshot u shared, the fb guy is saying that the carrying case doesnt have wireless charging like the galaxy buds. U might wanna google search if not others here will be confused by ur posts. Last edited by MrMundy; 10-03-2019 at 02:39 AM.. Seems like the Outlier Air is really popular. Any users here feel that its highly recommended? Or rather spend more and get TWEs like Sennheiser, Jabra, B&O etc? So when u r outside on the go and u put your ear buds back to the case it will auto charge your ear buds wirelessly and the next time u want to use it it will not be out of battery. If not when u want to charge it u got to put on the case, connect with a USB cable and charge it on the desk etc. I already pre order can’t wait to recieved it. May i know at which stage did the system prompt for the PromoCode? I went through the entire process and the final figure before credit card payment is still $119/-. Thanks! the new galaxy buds has pretty good reviews too. You can find them on carousell around $150-$170 from those guys who got it free with their phone purchase. During the order page. Before you click checkout there is a promo code just on top of the price. Apply there.